100 million Plague Inc. players infected worldwide! 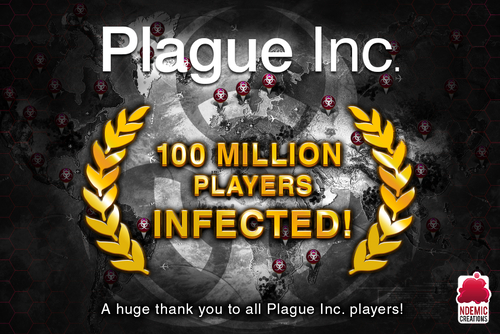 I normally wait until the end of the year for seismic number-based milestone updates, but this one is too exciting not to share with you all: Plague Inc. has now infected 100 million players worldwide (and counting)! To put that into perspective, that’s 1.3% of the entire global population. If Plague Inc. was a country it would be the 14th most populous nation in the world! That’s an incredible figure, and I’m so thrilled, and grateful, that so many people are playing and enjoying the game. We’ve been working on some very cool things going forward to keep Plague Inc. growing even more in the future, so be sure to keep an eye out for more news on that soon. We’ve also finalised the details of the second production run of Plague Inc: The Board Game. We’ll have a literal boat-load of new copies landing just in time for Christmas! Aside from that there’s still loads more to come from Ndemic - we’re only just getting started! - so be sure to follow us on Twitter and on Facebook for the latest updates.